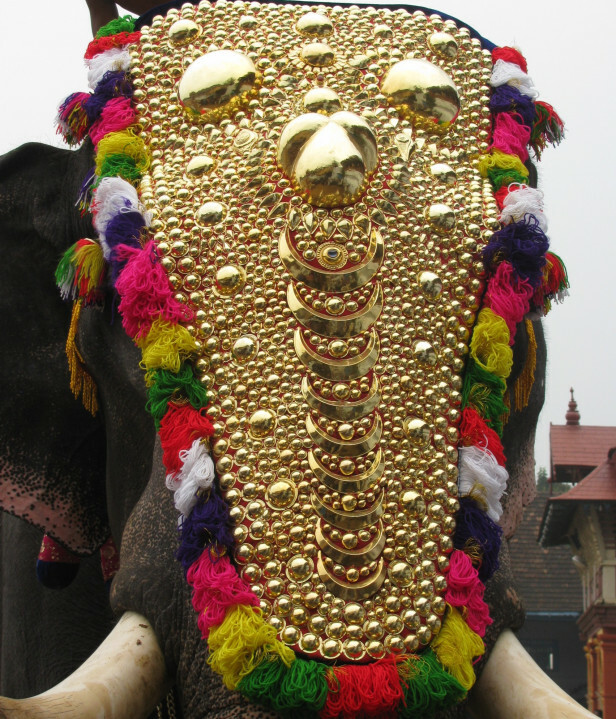 Devotees’ plea to protect the golden caparisons used for the idol carrying elephant of Lord Poornathrayeesa during the annual festival and during other special occasions get stronger as the Devaswom moves at a steadier pace to get it renovated. The governing body of the temple, the Cochin Devaswom Board and the Sree Poornathrayeesa Seva Sanghom, the temple’s management in-charge body recently decided to get the caparisons (Nettipattom and Kolam) refurbished and had launched the fundraiser. Although the fundraiser initially was pushed stating that the move was to make new sets, the latest press release announcing their motive to use the gold from the antique pieces has elicited shock and fear among devotees and others concerned. Dating back a few hundreds of years, the golden caparisons are composed of rare and precious stones and gems. It is believed that the Imperial Government had laid railway tracks to Cochin using the revenue generated from the gold in fourteen similar caparisons, which reiterates value of the materials. The recent move by the Board and SPSS is being justified by saying that the caparisons are small and do not fit taller elephants. However, experts state in contrary to the aforesaid statement that there are photographic evidences showing the same caparisons fitting majestic tusker of yesteryear such as Chengallur Ranganathan, Chennaas Narayanan, Cheloor Rajendran, Nanu Ezhuthachan Sreenivasan and so on, and there haven’t been any elephant bigger than these who have come after that, and the question of fitting does not arise at all. Devotees also alleged that the same forces who have questioned the existence of heritage structures like the Kalmandapam at the Sree Padmanabhaswamy Temple are behind the destruction of these antique pieces too. Earlier court had intervened and arrested a move to transfer all valuables from the Sree Poornathrayeesa temple to the Board headquarters at Thrissur. Relying on such positive interventions in the past, devotees are hopeful that the antiquities associated with the centuries old temple will be preserved.